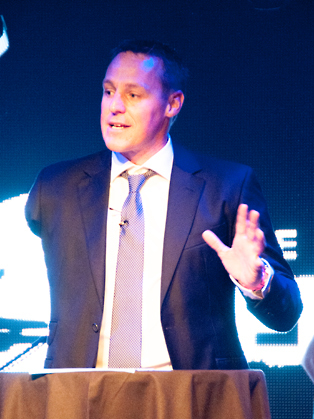 After making his international debut in the 1998 World Championships, reaching the 400m final and winning a silver medal in the 4 x 400m relay, by 2000 Danny was established as an international athlete and again returned to Australia to compete in the Sydney Paralympics, where he was narrowly beaten into the bronze medal position in the 400m. Danny went on to capture the European 400m title in 2001, before making the career-defining decision to turn his attention to the 800m – a move that bore instant results as he captured both the World indoor and European outdoor titles in 2003. In 2004 he set a new world record and became Paralympic champion at the Athens games. 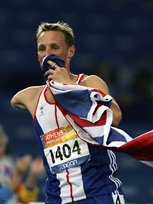 Danny was then a key part of the successful London 2012 bid team before going on to take gold at the 2006 World Championships, meaning he had won every major title in paralympic athletics. His athletics career continued to flourish, and Danny was looking forward to defending his title in Beijing 2008. He was given the honour of carrying the British flag at the opening ceremony, but was sadly unable to compete after sustaining an injury just before his race. Danny reluctantly retired from international competition in July 2009 but has already established himself as one of Britain’s top platform motivational speakers. Never one to rest on his laurels and always up for a challenge Danny has completed the gruelling Deloitte Ride Across Britain – 960miles in nine days on a bike. In 2012 he ran the London Marathon and is looking to better his time in 2013. He has also published his autobiography, “Danny Boy”. 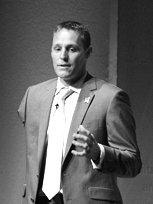 As a professional athlete for 12 years, during which time Danny represented Great Britain at three Paralympic games, he came to understand what it took to be successful. Danny had to know that when he stood on the start line, he had done everything he could to prepare for that moment. That is the only way Danny felt could truly believe that he could win. He argues that success in business is no different. Yes, having a goal is important, but he strongly believes the reasoning behind the goal is the key to success. How can you inspire yourself or your team to perform if they do not buy into the goals of the business? Danny has been delivering keynote presentations for over 14 years for many large organisations around the world, such as Lloyds, Adecco, Visa, Deloitte, Coca-Cola, Weetabix, Thompson Reuters and Wilson James. His presentations are built around the five key elements he has discovered to success, and is delivered in a manner that captivates and motivates. Danny does not believe you can tell people how to achieve their dreams, both personal and professional. But what you can do is motivate and inspire. And show that if you dare dream and follow his 5 steps, anything is possible. Who would have thought 20 yearrs ago, this slightly podgy Essex boy that often drank a bit too much could ever dream of becoming a Paralympic champion and World record holder. He most certainly did!